Jacquie Latimer wrote in: Mike, loved your website! I have some questions regarding the bus system and bus stops. My friend and I are coming to the Villacana resort in Estepona in November for a week. We’re planning to use the local buses and I saw on your site that there is a bus stop right outside the Villacana resort. 1) You are quite right. “Linea de Concepcion, La” is the same as the La Linea bus station which is what you need for travelling to Gibraltar by bus. To go to La Linea from Villacana you need to start your journey at the Estepona bus station. The long distance buses don’t stop at all the small stops in between the different towns. You can buy your ticket well in advance to La Linea bus station using the Gomarbella online bus ticket reservations page. Choose Estepona as your Origin and in Destination Linea La. 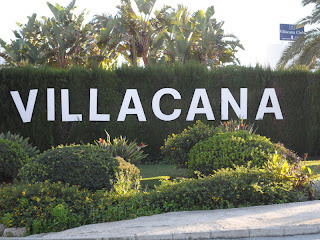 To get to Estepona bus station from Villacana I suggest taking a taxi from the resort, it’s a short journey and a lot simpler than the local bus into Estepona. 2) About paying on the bus, if you get on the bus at the Venta los Niños bus stop, to travel to Marbella or Estepona, the driver will give you change. He’ll appreciate it very much if you pay him in coins or with a €5 note or perhaps €10 at the most but he will give you change. At Malaga airport buy your ticket for the airport bus to Marbella bus station from the little transport office just as you come out of Arrivals up until 8pm. After 8pm buy your ticket on the bus. At the airport, if you are lucky enough to catch the direct bus to Estepona from the airport you will get off at Estepona bus station, because the direct bus to Estepona does not stop at all the intermediate stops. My suggestion is that if you get to Estepona on the direct bus or miss your Villacana stop for any reason, just take a taxi back to Villacana, from the taxi rank next to the Estepona bus station. It’s very close and after two bus rides, you’ll be wanting to get yourself to the resort to take things easy as soon as possible. Travelling from Marbella or Malaga airport towards Villacana you will get off at the Hotel Gran Playabella bus stop, use the footbridge to cross the busy A7 coastal highway on the footbridge then pull your suitcase approximately 300 metres towards Estepona on the sea side of the road before you see the Villacana Club Reception on your left. Travelling in the other direction, from Villacana back towards Marbella bus station to do your trip to Malaga airport in reverse, you will get on at the Venta los Niños bus stop right next to the entrance to the Villacana resort. Curiously enough neither of the two bus stops is called Villacana but that’s what they are known as! Just to make things easier still, here is a list of all the bus stops between Estepona and Marbella. Hi Catherine, yes, after your journey out you probably won't want to wait another two hours for the 22.30 bus which will get to Marbella bus station only ten minutes before the last bus from Marbella to Estepona leaves at 23.25. Being dark, a taxi from Marbella bus station to Villacana would be the most practical at that stage. Instead of waiting at the airport though you could always take the next train from Malaga airport to Fuengirola train station which is the last stop on the line. It's a comfortable and easy if not enjoyable 43 minute journey, there are trains every 20 minutes and it'll cost less than five euros. When you get to Fuengirola train station come up the stairs and there's a taxi rank right outside. From the Fuengirola train station pick up your taxi to go to Villacana. By taking your taxi from Fuengirola, you'll save at least €30 over the taxi journey all the way from Malaga airport to Villacana and you will have seen a bit more of the Costa del Sol. Well maybe not if it's dark! 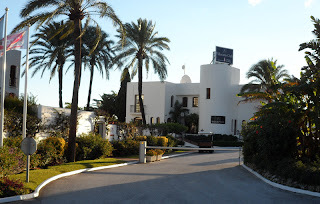 On the way back to Malaga airport, everything will be in your favour, you can pick up the airport bus in Estepona if the times work out (less buses on the winter schedule) or take the local bus from in front of Villacana (or a taxi) to Marbella bus station then the shuttle bus to the airport. This will keep travelling costs down and bring the cost of your Fuengirola to Villacana taxi down. Thank for this extremely useful and detailed information about travelling by bus to Villacana. I will be visiting Villacana in February and have been looking at the bus timetables and routes you suggest. Unfortunately I arrive at Malaga airport at 20:20 and the next bus to Marbella bus station appears to be at 22:30. Do you have any other suggestions about how to get to Marbella without having to wait 2 hours for the next bus?